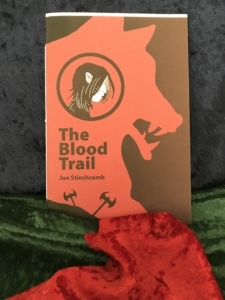 Does the title The Blood Trail tell us something right away about how these four tales work together? The title drifted up from my unconscious one day and I knew it was right. I wanted to talk about the female body and violence, both inside and out. If you are living in a female body, there’s a good chance you’ve experienced some pain and loss, whether or not you’ve had a child. Blood figures in narratives with male heroes, but it’s a different kind of blood, often associated with warfare or murder. Some of us in female bodies feel like we’re at war within ourselves, either because of menstruation or pregnancy or childbirth. Or menopause. There are many ideas that society forces on us about what (and whom) we should desire. We’ve got all this going on, and then, in our teens or earlier, male attention begins its assault, whether we want it or not. The four stories in my chapbook are tied together by blood imagery and actual blood, and they follow the different phases of female life. In the first story, “Sever,” you write: “What I learned was that my lord was trying to kill their stories, every time, from the songs of the farmer’s daughter to the refined verses of the highest lady. He so feared the kingdom of the imagination that he had to separate it from the body.” These sentences grabbed hold of me and won’t let go. What do they mean to you? These sentences describe the way patriarchy controls the narrative of the human condition. With respect to violence and abuse, silence becomes crucial to the perpetrator. Certain stories are too dangerous to be spoken because the world might fall apart, families might dissolve, and marriage could lose all meaning. Implicit is the notion that trauma lives on in the body itself, thus the need to separate memory from its physical source, the bodily crime scene. How would you describe the relationship of these stories to the fairy tales of old? Obviously I’m drawing on specific tales: “Bluebeard,” “Red Riding Hood,” and “Puss in Boots,” to name a few. For me the fairy tales never die: they go on and on because we need them. Each generation brings its own unresolved problems to fairy tales and myth. I hope that readers find my tales make them want to revisit the originals. I’m a fan of recursive stories, though I’m more familiar with them on the screen (big or little), for example the movie Groundhog Day and the Netflix series Russian Doll. Your story “Rescue and Conquer” contains these endless loops of action among various wolves and woodsmen, young women and grannies. Every so often, a character has an insight peculiar to him/her. It’s an outstanding way to deconstruct a fairy tale while at the same time creating a brand new story. Did you pick this structure, or did the structure pick you? have the sense that this story recurs endlessly, but also that she survives every time. “The Mixed Children” is such a rich story, with wonderful characters and a provocative, mysterious world. Would you consider expanding this to novel-size, or writing more stories with these characters? “The Mixed Children” is one of those pieces that exists in many different forms on my hard drive. In the past it did push out, I’m sure, to novella length at least. Maybe a series of interlinked stories is the way to go. Those characters are always dancing around in my head, and I would rent a place in their apartment building in a second. Is anyone in The Blood Trail tame? Great question! My gut instinct is to scream NO. What good does it do you to be tame? On the other hand, maybe being tame is the way we prevent carnage. The woodsman character in general and some of the mothers in “The Mixed Children” are walking the fine line between tameness and adventure. In a way the mother character of the final story, “Rosamund’s Dress,” is in a state of mourning because she has not been allowed to be free and wild enough. 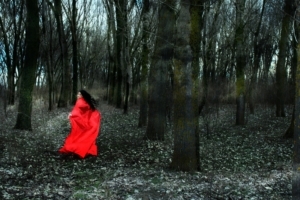 When did fairy tales begin to inspire your work? We had a copy of The Golden Book of Fairy Tales, gorgeously illustrated by Adrienne Ségur, on my parents’ bookshelf, and when I was a little girl, I made a point of carefully reading each and every story. Growing up I began noticing the famous fairy-tale rewrites. I picked up a copy of Tanith Lee’s Red As Blood in a drugstore––do you remember when you could buy paperbacks everywhere? Of course, there was Angela Carter’s The Bloody Chamber, and Kissing the Witch by Emma Donoghue came along later. It was impossible not to try to write my own fairy tales. And one other thing: the year I was pregnant with my first child, The Golden Book of Fairy Tales was reissued, which I took as a sign. For any potential reader who isn’t inclined toward fairy tales, what would you say to change their mind? I would say forget about Disney! I love Snow White but I don’t have much use for the traditional Disney princesses. For some reason the genre is often dismissed and disparaged, but I would remind everyone of the darkness of the original tales. Never forget that Cinderella’s stepsisters actually cut their feet with a knife to get them to fit into that slipper, or that the sea witch cut out the Little Mermaid’s tongue. And in many ways the fairy tales are the people’s genre, connected as much to the soil as to the court. I am always writing short stories and flash, and right now I am trying to find an agent/publisher for my mermaid novel. My heroine is trying to have a family life on shore, but she’s nothing like cheerful Ariel, or the self-sacrificing Little Mermaid. There is plenty of attention to monsters, motherhood, and gender justice. Where can we buy The Blood Trail? 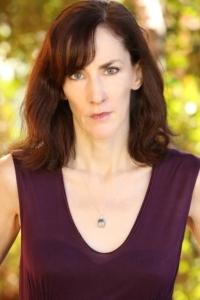 Jan Stinchcomb is the author of The Blood Trail (Red Bird Chapbooks) and Find the Girl (Main Street Rag). Her stories have appeared in Longleaf Review, FlashBack Fiction, Gravel, Monkeybicycle and matchbook, among other places. She has been nominated for the Pushcart Prize and Best of the Net Anthology, was longlisted in the Wigleaf Top 50, and is featured in The Best SmallFictions 2018. Currently living in Southern California with her family, she is a story editor for Paper Darts. Find her at janstinchcomb.com or on Twitter @janstinchcomb.